Interactive computer simulations are effective learning tools commonly used in science education; however, they are inaccessible to many students with disabilities. In this paper, we present initial findings from the design and implementation of accessibility features for the PhET Interactive Simulation, Balloons and Static Electricity. Our focus: access for screen reader users. We designed an interaction flow that connected keyboard interactions with reactions in dynamic content. Then using a Parallel Document Object Model (PDOM), we created access to simulation content and interactive sim objects. We conducted interviews with screen reader users to evaluate our progress, and to understand better how they engage with interactive simulations. 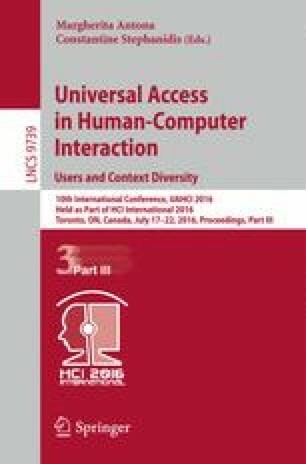 We share findings about our successes and challenges in the design and delivery of dynamic verbal text description, of efficient keyboard navigation, and the challenges we faced in making a keyboard accessible drag and release mechanism for a highly interactive simulation object, a Balloon. We would like to thank Jesse Greenberg (PhET software developer) for his significant implementation efforts and design insights. We would also like to thank Shannon Fraser and Sambhavi Chandrashekar for support during the interviews. Equipment and space for interviews was provided by DELTS Media Services (thanks to Darcy Andrews and Mark Shallow) at Memorial University and by the Inclusive Design Research Centre (thanks to Vera Roberts and Bert Shire). Funding for this work was provided by the National Science Foundation (DRL # 1503439), the University of Colorado Boulder, and the William and Flora Hewlett Foundation. Any opinions, findings, and conclusions or recommendations expressed in this material are those of the authors and do not necessarily reflect the views of the National Science Foundation.